Perched at an altitude of about 1950m, Manali is a beautiful hill station in the state of Himachal Pradesh. 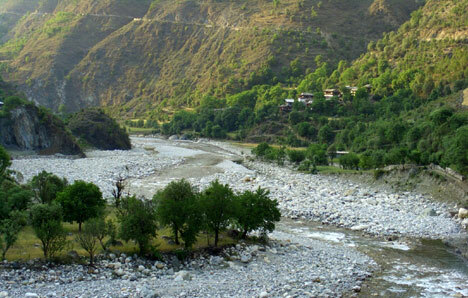 It is located just 40 km away from Kullu and is abundant with flora and fauna. Blessed with pleasant climate and exquisite natural surroundings, Manali serves to be a major tourist destination in the state. 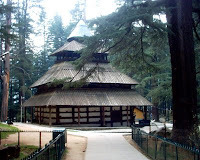 There are many place of tourist attraction located in and around Manali. Beas Kund: This serene lake is situated just 21 km north of Manali. It serves to be an originating place of famous Beas River. The lake also holds religious significance as it is believed that the sage Vyas once used to take bath at the water reservoir. The place serves to be an ideal picnic spot among the tourists visiting Manali. Camping and trekking here are preferred activities of the tourists. Rohtang Pass: Rohtang Pass is a high altitude mountain path which connects Kullu to Spiti and Lahaul. Known for offering breathtaking views of glaciers and imposing mountains, Rohtang Pass is hardly missed by the tourists visiting Manali. Rohtang Pass also serves to be a gateway to other nearby places of attraction. 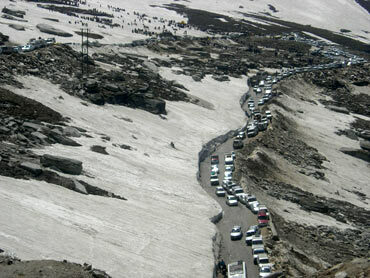 Abounded with several picturesque locations, Rohtang Pass is visited by a number of tourists. Hadimba Temple: It is a prominent place of worship located just 2km away from the center of Manali town. The temple is dedicated to goddess Hadimba which once served as the patron deity of Kullu Kings. Built in the year 1553, Hadimba Temple is four-storied wooden structure. Beautiful carving of images of main deity is a striking feature of the temple. The temple is perched deep in the dense lush green forest and is visited a large number devotees and tourists as well. Besides these places of attraction, Manali offers many other places of interest in and around it. Pandoha Dam at Kullu, Solang Valley and the Great Himalayan National Park at Kullu are other much visited tourist places near Manali.